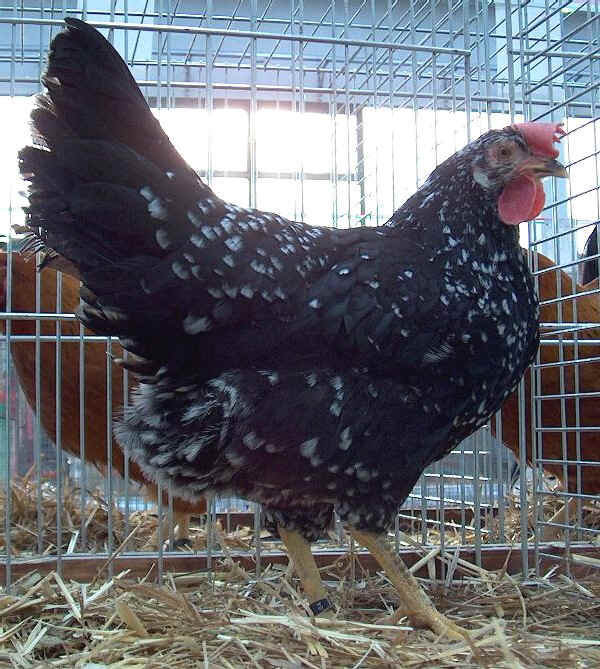 and only in 1880 the breeder M. Cobb succeeded in obtaining a perfectly mottled livery, showing his splendid flock of Ancona. Later on, in 1910, in Birmingham a new rose-combed variety has been shown. Some Counties added to the breed Standard this variety. The British Ancona strain is bigger in size than the Ancona strain selected in U.S.A. The Ancona is anyway a light bird and an excellent layer (eggs with white shell). The Ancona has a black livery, with petroleum shades, mottled with white, some feathers end with a V-shaped white spot. The plumage is soft and tight to the body. The head is of medium length. The body is long and broad at the shoulders. In the Italian Standard the comb is single, erect, with five well-developed points. In the male it follows the neckline with a big posterior blade. In the female it’s carried folded, without covering the eye. The beak is strong, slightly curved and yellow, with black shades on the upper part. The eyes are orange-red, big and bulging. The earlobes are almond-shaped and white but a slightly creamy colour is admitted. The wattles are of medium size and red. The face is red and smooth. The neck has a rich neck hackles. The back is broad and well-shaped. The wings are ample, horizontally worn and tight to the body. The breast is broad and slightly prominent. The tail is big with abundant plumage, opened, of medium length, carried with an angle of 45-50° in males and 40-45° in females. The legs are of average length and clearly distinguishable; the shanks are of medium size, without feathers, yellow with dark pencilling from slate-grey to black (absent or rare pencilling is not considered a heavy defect), 4 toes. The eggs weight minimum 50 g, with a white shell. The plumage is fairly soft and tight, abundant with wide and rounded feathers. The only colour is Black White-Mottled. Both in male and female the plumage is bright black greenish. The motif is made by V-shaped white spots on the top of some feathers (approximately 1 every 3 feathers). A too intense or too impure mottle are heavy defects.